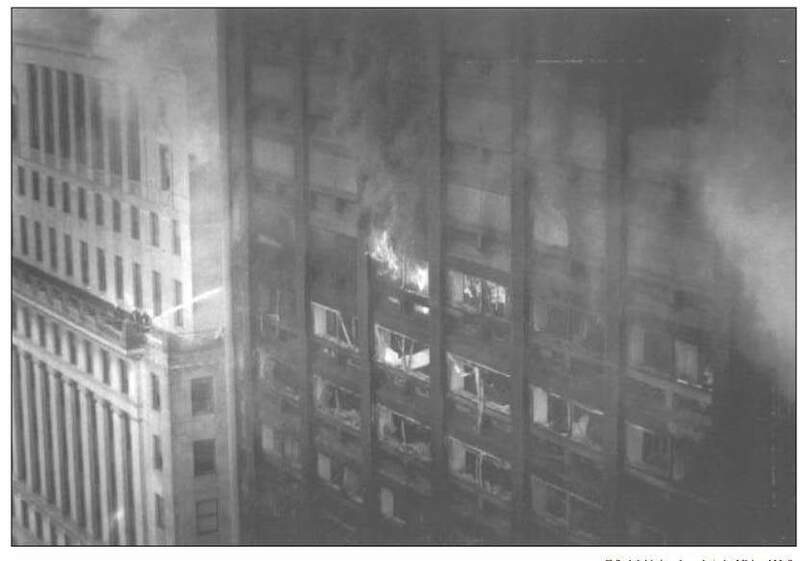 This report on the Philadelphia, Pennsylvania, One Meridian Plaza fire documents one of the most significant high-rise fires in United States’ history. The fire claimed the lives of three Philadelphia firefighters and gutted eight floors of a 38-story fire-resistive building causing an estimated $100 million in direct property loss and an equal or greater loss through business interruption. Litigation resulting from the fire amounts to an estimated $4 billion in civil damage claims. Twenty months after the fire this building, one of Philadelphia’s tallest, situated on Penn Square directly across from City Hall, still stood unoccupied and fire-scarred, its structural integrity in question. This fire is a large scale realization of fire risks that have been identified on many previous occasions. The most significant new information from this fire relates to the vulnerability of the systems that were installed to provide electrical power and to support fire suppression efforts. In this incident there was an early loss of normal electrical power, a failure of the emergency generator and a major problem with the standpipe system, each of which contributed to the final outcome. These experiences should cause responsible individuals and agencies to critically reexamine the adequacy of all emergency systems in major buildings. When the initial news reports of this fire emerged, attention focused on how a modern, fire-resistive high-rise in a major metropolitan city with a well-staffed, well-equipped fire department could be so heavily damaged by fire. The answer is rather simple -- fire departments alone cannot expect or be expected to provide the level of fire protection that modem high-rises demand. The protection must be built-in. This fire was finally stopped when it reached a floor where automatic sprinklers had been installed. This report will demonstrate that the magnitude of this loss is greater than the sum of the individual problems and failures which produced it. Although problems with emergency power systems, standpipe pressure reducing valves, fire alarm systems, exterior fire spread, and building staff response can be identified, the magnitude of this fire was a result of the manner in which these factors interacted with each other. It was the combination of all of these factors that produced the outcome. A fire on the 22nd floor of the 38-story Meridian Bank Building, also known as One Meridian Plaza, was reported to the Philadelphia Fire Department on February 23, 1991 at approximately 2040 hours and burned for more than 19 hours. The fire caused three firefighter fatalities and injuries to 24 firefighters. The 12-alarms brought 51 engine companies, 15 ladder companies, 11 specialized units, and over 300 firefighters to the scene. It was the largest high-rise office building fire in modern American history -- completely consuming eight floors of the building -- and was controlled only when it reached a floor that was protected by automatic sprinklers. A table summarizing the key aspects of the fire is presented on the following pages.